This article, related to the requirements of bonding bulk delivery vehicles, first appeared in the 2014 Nov/Dec edition of Propane Canada Magazine. I have recently been involved in a project that looked at the regulatory requirements for bonding between a propane delivery vehicle and the propane container being filled. Static Electricity in the Propane Industry published by the Propane Education & Research Council (PERC). The handling and transportation of propane is governed by the Transportation of Dangerous Goods (TDG) Act and Regulations. The regulations govern the construction of bulk transport vehicles with respect to the propane tank and attached components used in the transfer to or from the bulk transport vehicle. The TDG Regulations also govern the loading and unloading of the bulk transport vehicle. 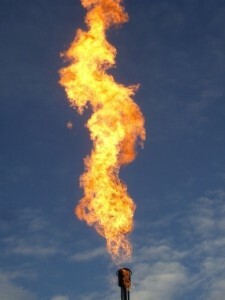 The TDG Regulations classify propane as a Class 2.1 Flammable Gas. 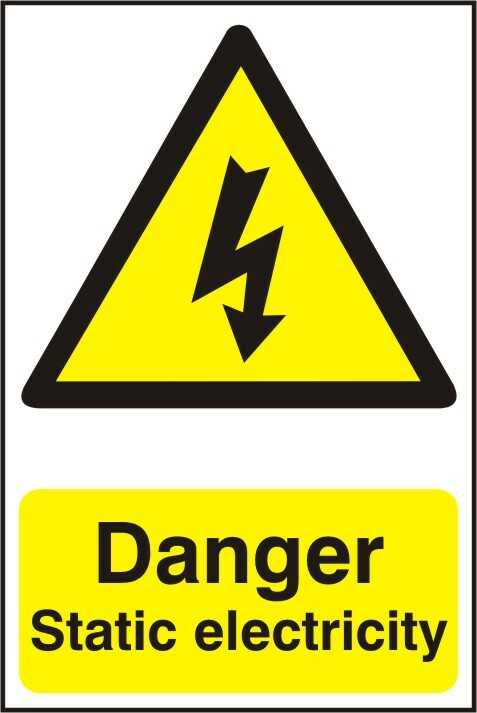 This Standard is adopted by the TDG Regulations and states under the heading of Loading and Unloading, that “a means of containment shall not be used where a fire hazard exists; precautions have been taken to prevent a difference in electrical potential between conductive surfaces and to ensure safe dissipation of static electricity through bonding or grounding, or both, as appropriate”. Comment: The Standard stipulates that a container cannot be used where a fire hazard exists and requires that precautions be taken to prevent electrostatic discharge. The Code applies, for purposes of this document, to the storage, handling, and transfer of propane and the installation of containers and equipment to be used for propane at customer locations. The Code states that all tank trucks, tank trailers, and cargo liners must be designed, fabricated, and marked in accordance with the requirements of CSA B620. The electrical requirements of the Code and the sections dealing with propane cylinder and tank filling are silent on the subject of controlling static electric charges during the propane transfer between the containers and a propane bulk transport vehicle. However, the Code does state that, where specified for the prevention of fire or explosion during normal operation, ventilation is considered adequate where provided in accordance with the provisions of the Code. 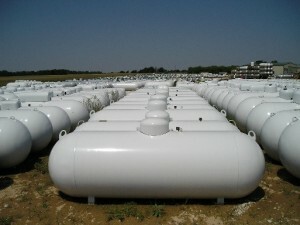 The Code requires that propane is transferred from one container to another by a person who is the holder of a certificate recognized by the authority having jurisdiction. 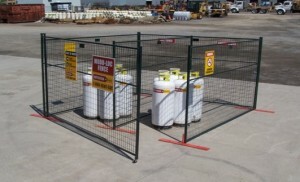 The propane container must be filled in a location that is well ventilated. Comment: For purposes of this document the CSA-B149.2 Code is silent and does not provide any regulatory requirements with respect to the issues of static electric charge during the process of transferring propane from a propane bulk transport to a consumer’s propane cylinder or tank. 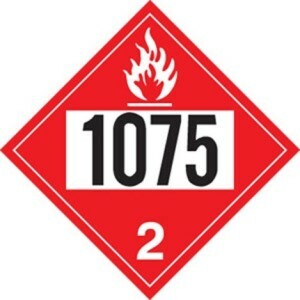 The Code does speak to the control of static electric charge, however, the Code states that it does not apply to the transportation of flammable liquids or combustible liquids under the TDG Regulations. Comment: For purposes of this document the National Fire Code requirements do not apply. The Code references the TDG Regulations when it comes to handling and transporting propane. The objective of the Code is to establish safety standards for the installation and maintenance of electrical equipment. The scope of the Code covers all electrical work and electrical equipment operating or intended to operate at all voltages in electrical installations for buildings, structures, and premises. This includes factory built relocatable and non-relocatable structures, and self-propelled marine vessels stationary for periods exceeding five months and connected to shore supply of electricity continuously or from time to time. Comment: For purposes of this document the Canadian Electrical Code requirements do not apply. The Code does not specifically address the issues of controlling static electric charge during the process of transferring propane from a propane bulk transport vehicle to a consumer’s propane cylinder or tank. 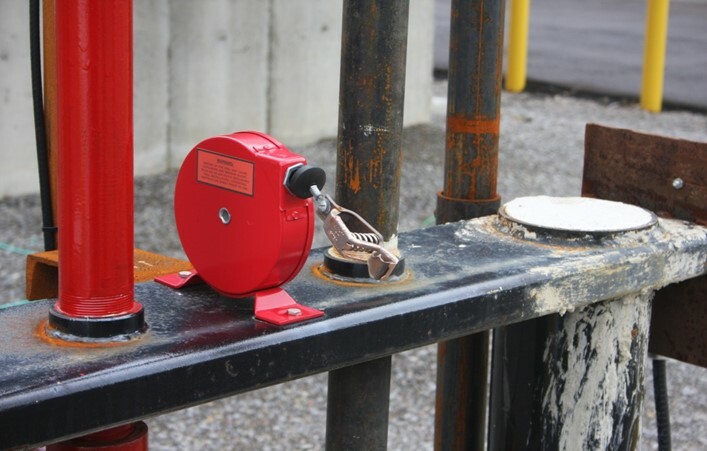 The OHS Explanation Guide published on the Alberta Human Services website clarifies that the product under discussion in Part 10 Section 163 (2.1) is flammable liquids, not a flammable gas such as propane. For purposes of this document the Alberta OHS Code Part 10 Section 163 (2.1) requirements do not apply. The Code requirements for bonding or grounding are for flammable liquids, not flammable gases such as propane. The Regulation states that metallic or conductive containers used to transfer flammable liquids must be electrically bonded to each other or electrically grounded while their contents are being transferred from one container to the other. Comment: While the B.C. OHS Regulations discuss the requirement for Flammable Gases in other clauses within the same section, the specific clause for grounding or bonding references Flammable Liquids only, not Flammable Gases. For purposes of this document the B.C. OHS Regulations requirements do not apply as they only require bonding or grounding for flammable liquids, not flammable gases such as propane. NFPA 58 is an American Code that is not mandated for use in Canada. That being said, NFPA Codes and Standards are often used when an equivalent Canadian Code or Standard does not exist or for comparison of requirements where a Canadian Code or Standard does exist. Static electricity is generated when liquids move and come into contact with other materials. If the accumulation of static is sufficient, a spark may occur in the presence of a flammable vapour-air mixture, and ignition may result. Where a static spark and flammable mixture may occur simultaneously, suitable preventative measures are required to avoid ignition. Propane industry experience has shown that there have been a number of fires and explosions in which an electrostatic charge was the source of ignition. For this to occur liquid propane must be released at a high velocity, creating a mixture of liquid drops, then vapour, air, and water drops (due to condensation of water vapour in the air from the refrigerating effect of vaporizing liquid) can generate an electrostatic charge. This charge might be of sufficient energy to cause ignition of the mixture. High-pressure propane liquid releases as described in the previous paragraph can occur when the pressure relieve valve (PRV) on a liquid-full propane container releases the liquid propane to the atmosphere due to over pressurization of the propane container. PRVs are installed within the 20 percent vapour zone on top of the liquid propane. This type of electrostatic charge is not created during the normal propane transfer process from a bulk transport vehicle to a consumer’s propane cylinder or tank. 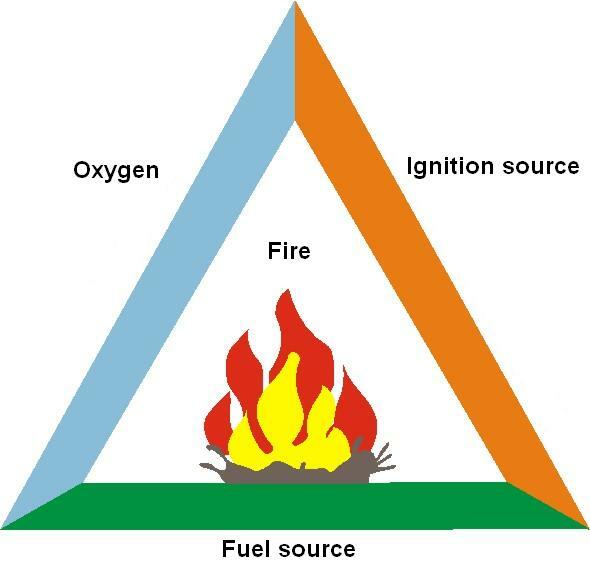 For a fire hazard to exist, three components – fuel, air and an ignition source must be present. 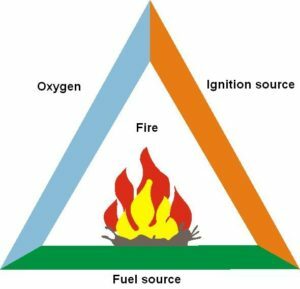 The ignition source must occur simultaneously with the fuel vapours and air being mixed at the point of ignition within the fuel’s range of flammability. For propane, the flammability range is 2.4 to 9.5 percent volume in air, and requires an ignition temperature of 493⁰ to 549⁰ C. Below 2.4 per cent, the mixture is too lean to ignite. Above 9.5 percent, the mixture is too rich to ignite. Removing one or more of the three components removes the fire hazard. 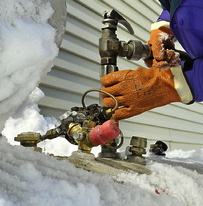 The transfer of propane liquid between the bulk transport vehicle and the consumer’s cylinder or tank is a closed system with the delivery hose fill nozzle being threaded to create a leak tight seal to the fill valve of the propane container prior to the transfer of liquid propane taking place. A minimal amount of controlled propane vapour/liquid is released to the atmosphere during the filling process through the fixed liquid level gauge. The gauge indicates when the propane container is filled to its maximum permitted volume. Once the container is filled, the gauge is shut off, stopping the release of propane vapour to the atmosphere. The fill nozzle releases a legislated amount of propane liquid, approximately 2 to 4 cc to the atmosphere when the nozzle is first loosened from the container’s fill valve. This propane, along with any released from the fixed liquid level gauge, is well dispersed by the time the fill nozzle is removed from the fill valve of the container. If a static electric arc should occur at this point, there is no fuel to ignite. Operators are required to wear clothing which will not generate static electric charge while transferring propane. The seven items listed above prevent the three essential components occurring simultaneously, which are needed to have an area or process classified as a fire hazard. Therefore, the volume filling of a consumer’s cylinder or tank does not create a fire hazard. In addition, the existing operating procedures and equipment utilized satisfy the requirement that precautions are to be taken to prevent electrostatic discharge during the transfer process. Current industry practices provide suitable preventative measures to avoid ignition of any propane released to the atmosphere during the filling of consumer propane containers. Therefore the need for bonding between a propane bulk transport vehicle and propane containers during the transfer process is not required. There are no legislative requirements that require a person to bond between a propane bulk transport and a customer’s cylinders or tanks during the transfer process. 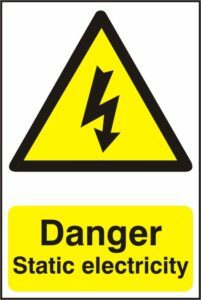 The only legislated requirement to ground or bond is provided in the TDG Regulations where a fire hazard exists or precautions to prevent electro-static discharge have not been taken. As stated above, current industry practices provide suitable preventative measures to avoid ignition of any propane released to the atmosphere during the filling of consumer propane containers. Therefore, the TDG Regulations do not apply and the need for bonding between a propane bulk transport vehicle and propane containers during the transfer process is not required. This document clarifies the minimum requirements for installed gas-burning appliances and equipment to be in compliance. This article, explaining the importance of documenting compliant propane installations, first appeared in the 2014 Jul/Aug edition of Propane Canada Magazine. The CSA B149.1 Natural Gas & Propane Installation Code requires that a propane technician must ensure that appliances, accessories, components, or equipment installed by him/her are installed in compliance with the Code. The person initially activating the appliance must also validate that the appliance is left in safe working order. One issue not spelled out in the Codes is: “How do you prove years later, that you left a compliant safe operating propane installation?” Companies that operate under a due diligence umbrella have processes in place that include documenting the installation to show that, at the time of installation, the installation was completed by a qualified employee, it was done so in compliance with the Code, and the appliances were left in safe operating condition. Personal due diligence refers to actions that are reasonable under the circumstances and that would be expected from a reasonable person. In other words, it means taking responsibility for your actions, making your own decisions, and being able to explain logically your actions and decisions. The role of the propane technician in the due diligence process is to make the decision to use approved materials to install the appliances, piping, tubing, fittings, regulators, venting systems, etc., and to install only approved appliances for the purpose for which they were designed. The Code defines “approved” as being acceptable to the authority having jurisdiction (AHJ). The Code identifies which materials are acceptable with respect to piping, tubing, fittings and venting systems. These materials are acceptable to the AHJ when the Code is adopted by provincial or territory regulation. An appliance, equipment, a component or an accessory is acceptable to the AHJ if it bears the label or symbol of a designated testing organization or a label or symbol authorized by the AHJ certifying that it complies with an approved standard or laboratory test report. Designated testing organizations are identified in the provincial or territory regulations that adopt the Codes. Underwriter Laboratories Inc. (ULI), which is US based. The ULI label must bear a small “c” to show that the approval designation is acceptable in Canada. The use of approved materials, appliances and components, and installing them in compliance with the Code and manufacturers’ installation instructions, shows that due diligence has been applied in the physical aspects of the installation. Written documentation, supported by digital photographs is a good way to record that the physical aspects of the installation complied with the Code and manufacturer’s installation Instructions. A propane technician needs to verify that the propane supply pressures are correct and that the appliances operate as designed. Cycle the appliances several times to make sure the operating and safety controls are functioning properly. The weak link in proving that a propane installation was compliant and that the appliances were left in a safe operating condition is the failure to complete the documentation in a manner that accurately records the essential elements of the installation’s operating characteristics. Even though the physical aspects of an installation may have been completed to Code, the lack of accurate documentation can, at a later date, bring the integrity of the entire installation into question. Questions that are often raised after an incident, in cases where documentation is inaccurate or lacking, is if the propane technician, in fact, completed the pressure test of the piping or tubing system, or if the installer actually verified the propane supply pressures and confirmed the operating and safety controls functioned as intended, etc. To prove that an installation was compliant and appliances were left in safe operating condition, my advice to propane technicians is to take a few photographs and to apply as much due diligence in completing the written documentation as in performing the physical aspects of the installation. While certified propane technicians know how to install appliances they must be properly trained on the company’s documentation which records the installation and setup of the appliances. Most companies use a checklist type of form to record the installation and appliance setup. A checklist is a greatly condensed way of identifying the items that must be checked. However, a checklist that lists “yes”, “no” or “n/a” as the answer to specific questions about the appliance installation can lead to misunderstandings if the technician is not trained on the use of the particular form. The checklist form needs to be supported by a document that speaks to all of the questions on the form. The support document is used to identify specific code sections, provide guidance when assessing an installation, and provides triggers for the technician to investigate further. Appliances that use interior air for combustion present one of the most complicated issues a propane technician must address; is there sufficient combustion and ventilation air in the space the appliance is installed? 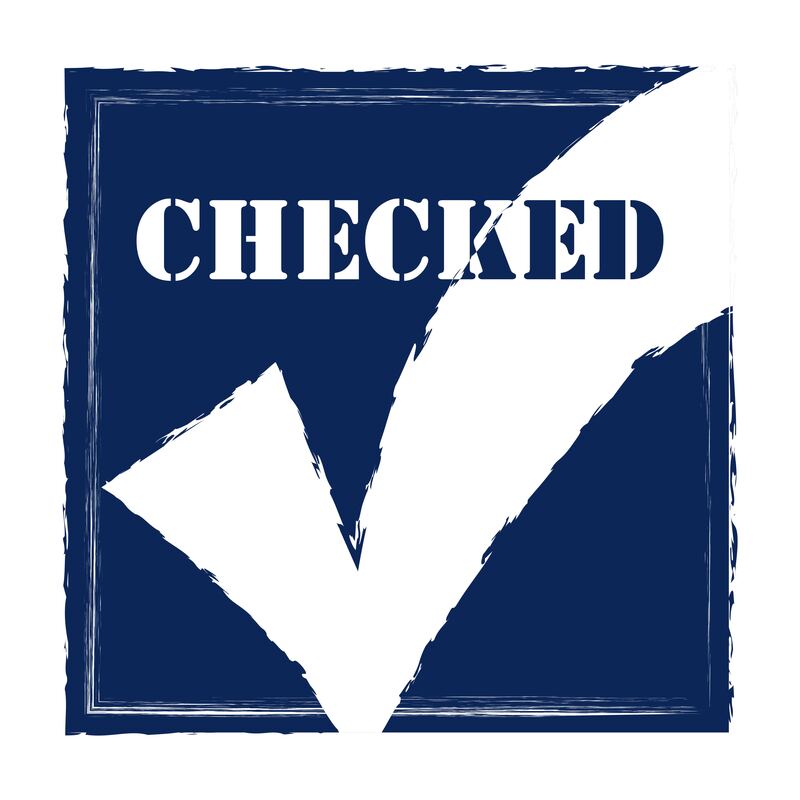 The checklist supporting document can provide guidelines, examples, and references which the propane technician can use to determine if, indeed, the space provides sufficient air to meet the needs of the appliance. From a corporate perspective, it is important that the documentation your company uses to document appliance installations is adequate to prove that a compliant installation was completed and the appliance was left in safe operating condition. The propane technician needs to complete the documentation accurately addressing all questions. Checkboxes left empty leave one wondering if the technician addressed the question. If the question is not applicable to the particular installation then indicate as so, rather than leaving a blank. Finally, take a few digital photographs and put them in the customer file. This article, which first appeared in the May/June 2013 edition of Propane Canada magazine, discusses the basic standard of care your company is expected to achieve as it relates to the technical regulatory aspects of conducting business in the propane and fuel oil sectors. Once an investigation into an incident is completed, I am often requested to provide an opinion as to whether or not an individual’s or company’s actions met the “industry’s standard of care”. 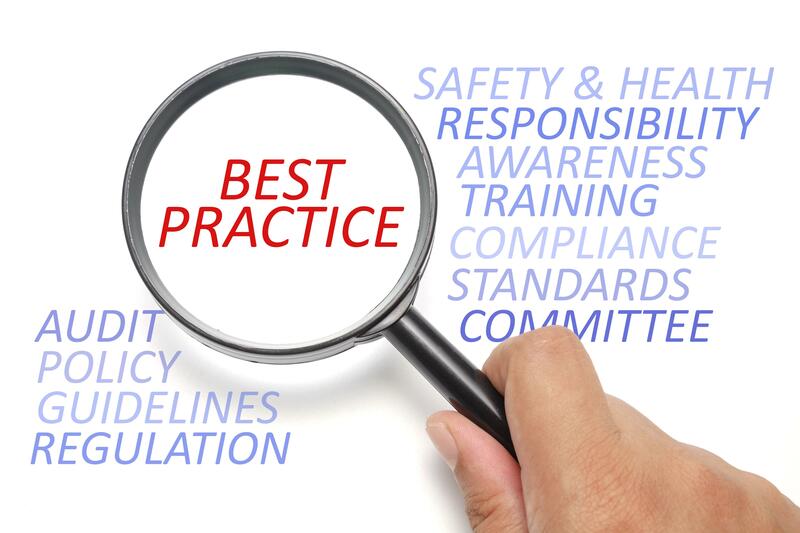 In this article, I focus on the issues of meeting the basic standard of care you are expected to achieve as it relates to the technical regulatory aspects of conducting business in the propane and fuel oil sectors. As quite a few propane distributors also have a fuel oil delivery component, I have extended this article to include the fuel oil aspects as well. Companies that deliver and provide services in both fuel sectors should adopt the same level of regulatory compliance for both fuels. When I am asked to look at an individual or company from the standard of care perspective, the first thing I do is compare the company’s practices and employee actions to the acts, regulations, & codes and standards in place at the time of the incident. I will also reference industry specific technical manuals, technical papers, manufacturer’s manuals/bulletins, and training and certification programs. If a person takes training and/or a certification program and fails to apply the knowledge learned in the program, it can be interpreted that the person failed to meet the industry’s basic standard of care. An example of the type of documents reviewed in conjunction with the regulations and codes during the development of a standard of care opinion would be two Canadian fuel oil technical manuals published in recent years. The manuals describe recommended and well-established practices for the installation and maintaining oil burners, furnaces, boilers, water heaters, and heating oil tanks and piping. The manuals establish the standard of care expected when conducting work in the areas identified. There are no such manuals within the propane industry, so an equivalent review, in this case, would focus on the appliance and equipment manufacturer’s literature. As you can see by the materials listed, the standard of care issue can go well beyond the regulation and code requirements that everyone is familiar with. It is important that, in addition to the regulations and codes, that you are aware of and familiar with all industry training programs, technical manuals, and manufacturer’s literature which describe how certain tasks are to be performed or maintenance conducted. Standard of Care – What Does it Mean? Standard of care is the degree of prudence and caution required of an individual who is under a duty of care. Certified fuel technicians, trained fuel delivery persons or persons who operate fuel storage facilities are, due to the nature of the product, expected to work under a “duty of care”. The requirements of the standard are closely dependent on the specific circumstances being discussed. Whether the standard of care has been breached is dependent upon the actions of the person or company, the company’s policies, and procedures, and is usually looked at in terms of compliance. Standard of care is often referred to as “industry standard of practice”, “best practices”, or “code of practice.” Whatever name is used, they essentially have the same meaning and outcome – to have a program in place that provides a vehicle for the company to meet or exceed the regulatory regime under which it must operate and to monitor the level of compliance on an ongoing base. The standard of care program provides the knowledge, policies, and procedures required by company personnel to meet everyday compliance requirements in the execution of their duties. maintenance of company and customer assets. A well written and implemented Standard of Care Program can result in less government regulation; in other words, the industry regulates itself. From the perspective of the Authority Having Jurisdiction (AHJ), there is an increased comfort factor on the operational aspects of the company. This allows the AHJ to focus human and financial resources on chronic non-compliant companies. The implementation of a documented Standard of Care Program can provide a model to approach the AHJ to forgo the requirements for formal timed and documented inspections and replace them with an ongoing quality assurance program. This is the same concept under which the natural gas utilities operate. While the tasks of putting together a Standard of Care Program can be daunting, the benefits greatly outweigh the resources required to develop, implement and monitor the program. It is much easier, satisfying and financially more profitable in the long run to operate the business well. 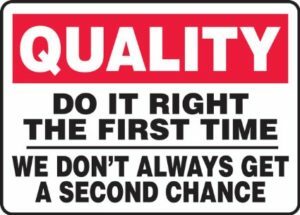 As Mike Holmes often says: “Do it right the first time”. By doing all things right the first time, you maximize the existing human, equipment and financial resources you have available. Cutting corners and getting away with a non-compliance exposes the customer and employee to a possible unsafe condition that could be life-threatening and expose the company to litigation. Companies can also see reduced worker compensation costs by a reduction in personal injuries through education, adherence to safe work practices and a healthier, more productive workforce. Another very tangible benefit can be reduced insurance costs through fewer vehicle accidents and customer incidents. The program can also provide a means of best operational practices to negotiate insurance premiums downward. I have seen in the past where any savings derived from not complying with the regulatory regime have been quickly eaten up by legal fees, insurance rate increases, and, worst of all, customer confidence. 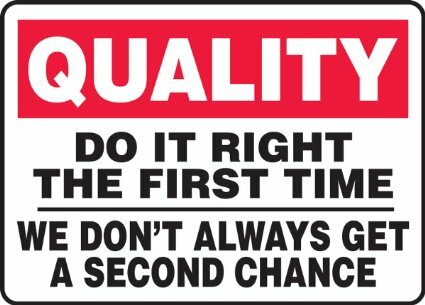 A company’s reputation is only as good as the last delivery, installation or service call. Customers who feel unsafe or experience a loss due to a company not adhering to the regulatory requirements or company incompetence will quickly create a negative reputation for that company. We all know that a poor reputation affects the company’s very existence in the marketplace. A Standard of Care Program can be infinite, dependent upon the corporate due diligence vision. 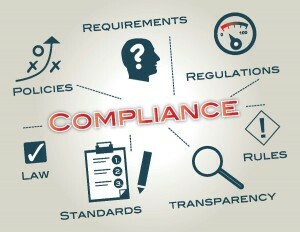 While it is feasible and possibly beneficial to exceed the basic compliance requirements, the corporation must be conscious that the level of compliance does not negatively impact the productivity and become a hindrance to conducting everyday business. As with most things in life, it is best if a balance can be achieved between the level of compliance and the company’s need to conduct business safely, efficiently and in a financially beneficial manner. I see the implementation of a Standard of Care Program as a multi-staged process where the program is developed and implemented in varying degrees. The basic Standard of Care Program establishes the minimum required regulatory compliance and monitors the company’s level of compliance. As you become more comfortable and meet the established compliance levels, specific areas of the company’s operation can be targeted to increase the compliance levels that can be shown to further benefit the customers, employees, and company. I believe if a company can have a document that provides the vehicle for the company to meet the minimum regulatory requirements, as provided in the acts, regulations, codes and standards, along with a mechanism in place to document and improve the percentage level of compliance, that company has made a great leap forward over its competition. You must remember that once the Standard of Care Program is put into place with compliance levels greater than the minimum regulatory requirements, the company will be held to that level of compliance. Its failure to meet the level of compliance could result in the company being fined, prosecuted or sued with little or no way of defending itself. It is, therefore, critical to the entire process that a monitoring program is put in place to continually provide feedback, identify problem areas and determine the compliance level the company is meeting. It is a complete waste of time developing and implementing a Standard of Care Program without a monitoring component being put into place. For the plan to be successful, companies must make regulatory management a key objective in the company’s overall operational strategy. Responsibility for the plan’s implementation and ongoing operation needs to be placed at a senior management level, with access to the CEO. As mentioned previously, the task can be very daunting when you start to consider all the components that go into developing a Standard of Care Program. My solution is the old saying: “How do you eat an elephant? One bite at a time”. In my view, a reasonable approach is to identify all the technical and regulatory requirements your company must meet. Then review each document to see how it impacts your company’s operation. Develop a running list of all the company’s offerings and activities. Eventually, you need to create a roadmap which consolidates the technical and regulatory requirements with the company’s operational objectives, employee needs, and customer expectations. The map provides the big picture overview you require to fully understand the components that will go into developing the plan and the direction to follow.